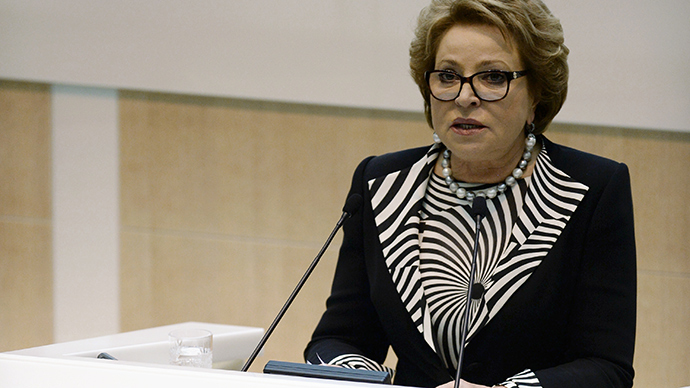 Federation Council Chair Valentina Matviyenko has ordered a vote on a parliamentary investigation into the recent activities of the Central Bank and its alleged role in the worst-ever plunge of the ruble rate. The motion was initiated by Senator Evgeny Tarlo (Tambov Region) who sits in the Upper House committee for economic policy. The senator added that according to the law, protecting financial stability in the country is the main task of the Central Bank and its senior management. However, the bank’s actions, in particular the recent raising of the key interest rate to 17 percent, have so far yielded the opposite results. “We have sufficient competence to sort the things out calmly and pass the information to the society and the president,” Tarlo said. He also said that in his last address to the Federal Assembly – a key speech detailing political and economic priorities of the nation - President Vladimir Putin said it was necessary to find speculators on the currency markets and take measures against them. Not a single speculator has been disclosed in Russia since address was delivered on December 4, the senator noted. Tarlo went on to suggest alternative measures that could help the Russian national currency to recover – a tax on foreign currency operations, state control on the banks’ trading positions and a ban for budget companies and state funds to put their assets on bank deposits. “Currently this money goes into forex gambling instead of working in the economy,” the senator explained. Thirty-four of the 170 senators must back the motion for the probe to be initiated. The Russian Central Bank is an independent organization that aims at maintaining maximum financial stability in the country. Together with the government, it also develops national economic and financial strategy. All Central Bank’s assets are federal property and its chairman is approved by the parliament after a candidate to the post is put forward by the president. The Russian ruble suffered one of the worst drops in its history on Monday and Tuesday, with exchange rates plunging more than 20 percent daily. The overall fall in comparison with the middle of the year is almost double. The head of Russia’s Central Bank, Elvira Nabiullina, blamed the situation on market speculators and noted that the devaluation of national currency should put an end to their activities. “We must learn to live in a new reality, to focus more on our own resources to finance projects and give import substitution a chance,” Nabiullina said on Tuesday. Earlier this week a group of State Duma MPs from the Communist Party sent an official address to Putin asking him to sack Nabiullina and all senior managers of the Central Bank as their current policies are causing the rapid devaluation of ruble and impoverishment of the majority of the Russian population. “They listen to your orders and then do the opposite,” the lawmakers complained.